How about a Liberty Apple? Maybe a Brooks Plum? An Asian Nijiseiki Pear? Or a Nikita's Gift Persimmon? Or a large bush you can train into a tree - a Blue Elderberry? All are chosen for our micro climate in Arbor Lodge. The Arbor Lodge Neighborhood Association Yard Fruit Tree Giveaway is coming up March 3rd - with a free workshop on planting and care too. 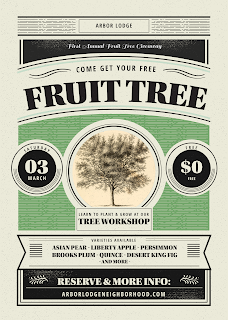 Mark you calendar and PLANT a TREE in your YARD that day - free! Trees made available through the Brian Duncan Fruit Tree Project to honor Brian and his contributions to our neighborhood. Reserve your tree now! How can we donate a tree? you have a fruit tree you'd like to donate? Is it in the ground, a pot? We need more information. How old, how long in the ground/pot? please email me directly at ginger.edws@gmail.com and thank you!